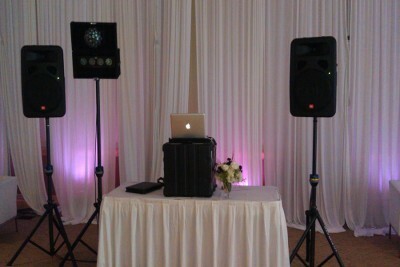 At JAMMIN’ DJs we take great pride and pleasure in every event, big or small that we get to be a part of. The joy we get from playing music, lighting up an event or just being a small part of each party is seriously what it’s all about. That said, some events just have that little tiny extra bit of awesome that makes our job just that much more worth it. Working with Budlight tends to give us some of the most fun and off the chain experiences. One of the events we got to work with alongside Budlight AND the National Football League this season was the “Up For Whatever Party” on Denver’s only Monday night game of the season in week 16 against the Cincinnati Bengals. Because of JAMMIN’ DJs relationship with Budlight, we weren’t only selected as the DJs of the incredible party but we also got to provide the lighting and help set up the entire event to it’s tip top rockingest state! It was over a week ago and we are also still totally jacked about the entire experience. Where to start…. First off, did I mention the event was sponsored by Budlight, the NFL and the Denver Broncos and was held in the house and backyard of a lucky couple just a bit West of Sports Authority Field at Mile High (the Broncos’ home stadium). They were provided with a giant screen and bleachers in their backyard where the biggest area of viewing would happen. They had a decked out living room where they had a huge projector screen T.V and really a mood that was set to perfection by JAMMIN’ DJs up-lighting. The pictures just don’t do it justice for how freaking cool this place was. Even after the first layer of coolness and JAMMIN’ was rockin’ the lighting and music that people were already pumped! Then we walked out to the living room fifteen minutes before the game was to start and our cool party had become one of the most kickass parties JAMMIN’ DJs has ever experienced. All time great Broncos, Karl Mecklenburg and Steve Watson were just casually standing in the living room, chatting with the fans and eating pulled pork sandwiches. Great right? Cooler than cool right? Well, behind the two ex-Broncos on a perfectly lit table, standing as two brilliant testaments to the Denver Broncos’ greatness, were the Lombardi Trophies from the ’97 and ’98 Broncos’ Championships. As most of the woman stood around complimenting the couple on how great the house looked and how good the food was, the men were huddled together around the two great awards drooling like crazed, hungry puppies. No shame to admit that the JAMMIN’ fellas were very much a part of the drooling group of guys. The one downside. ONE. Was that the Broncos lost to the Bengals after a poor game from Peyton Manning and the Denver Broncos Special Teams. Still, the Budlight “Up For Whatever Party” was nothing short of epic and JAMMIN’ DJs takes immense pride in saying that we were a large part of the “awesomeness”. Everyone who participated was over 21 and JAMMIN’ DJs, Budlight and the NFL were all together and will always be in like mind when asking EVERYONE to drink responsibly and to never drink and drive. We can only hope and pray that we get an opportunity to work with Budlight the NFL and the Denver Broncos for many years to come!